In this booklet Cosmic Healing II the emphasis is on connecting the body with the five elemental forces of nature, the moon and sun, the planets, the stars, galaxies and other celestial phenomena. This is a continuation of Maktak Chia's Universal Healing Tao System with Dirk Oellibrandt's Du Mai System for personal improvement. The author reveals not only the exoteric information, but more significantly they unveil the step-by-step practices both physical and meditative for healing oneself and others. Cosmic Healing II incorporates ancient Taoist knowledge and practices based on Taoist astronomy observations, color healing and cosmological research. Whether you are interested in building on your base of Chi Kung and meditation or whether you are body worker desiring to make giant strides in your treatments you'll find within Cosmic Healing II the substance for growth. The inner universe & outer universe become even more connected through planetaryigalaxy stellar meditations. 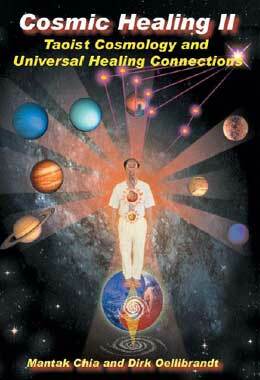 Cosmic Healing II teaches people how to take full charge of their health and well-being.